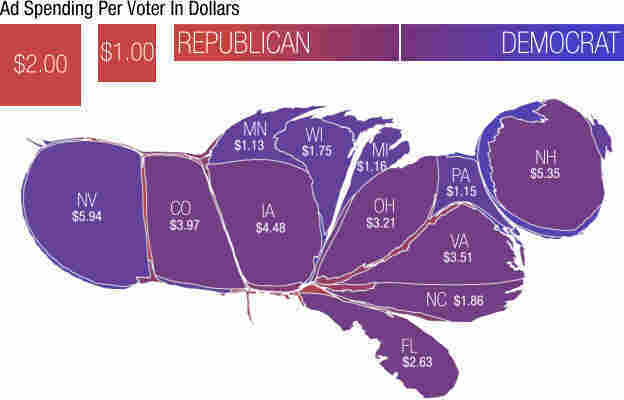 A Campaign Map, Morphed By Money : It's All Politics We've reshaped the United States based on where superPACs and other outside groups spent their money to air political ads aimed at influencing the presidential election. The result? One weirdly telling map. Campaign reporters spend a lot of time pointing at color-coded electoral maps like the one below, showing which states voted for Republican John McCain (in red) and Democrat Barack Obama (in blue) in 2008. But these maps lie — visually speaking. Red appears to be the clear winner, dominating a vast swath from the South to the Rockies. It's all geographically accurate, but electorally skewed. For example, Montana (three electoral votes) dwarfs Massachusetts (which had 12 electoral votes in 2008). To fix this problem, some political cartographers have resized the states based on their electoral vote tally. In this map, the influence of the Northeast is a bit more apparent, and the stature of the Mountain West has diminished. We've shaded the states based on their popular vote results in 2008. States that were split 50-50 are purple. But this map still doesn't accurately convey which states are most important in this election. 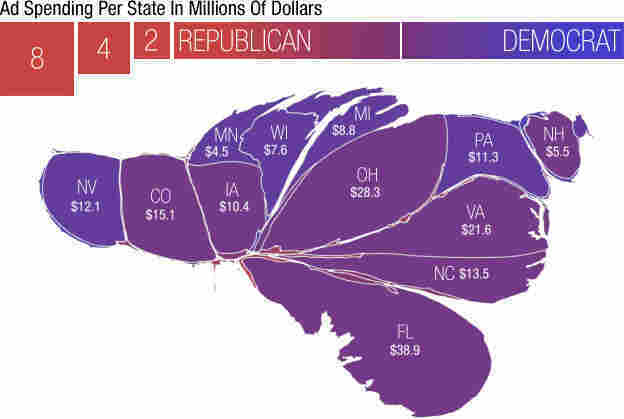 What would this map look like if states were scaled based on the outside money (not even including the massive ad spending by the campaigns of President Obama and Mitt Romney themselves) coming into the presidential race for political ads? We looked at ad spending on the presidential race from April 10 to Oct. 10, based on data from Kantar Media. The millions of dollars spent by superPACs and other outside groups send a clear message: There are really only 12 states in this presidential election. It's no surprise that they are all pretty purple. There is another way to think about this spending — how much is being spent on political ads by these groups per voting-age adult? Here, Nevada and New Hampshire take the lead. Though they don't have large populations, both states are seeing millions of dollars invested by outside groups on ads related to the presidential contest. That works out to more than $5 per adult. So if you're lucky enough to live in the Granite State, congratulations. In some ways, your vote is a thousand times more valuable than the votes of your neighbors in Vermont. 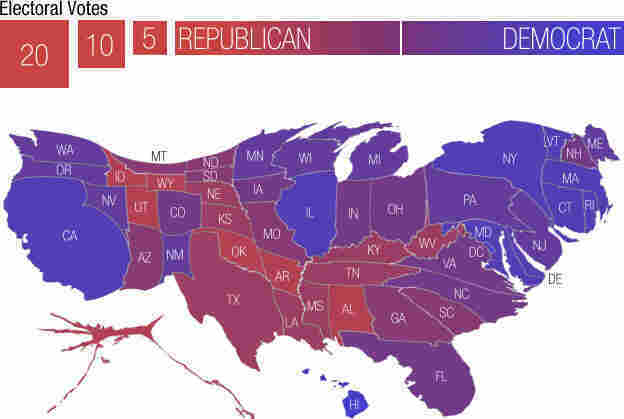 A previous version of the electoral vote map incorrectly depicted Missouri as having been won by Barack Obama.